PaperFlow provides tidy storage solutions for both the home and office. PaperFlow Stackable Master Literature Organizers can be used alone or in combination with other PaperFlow Stackable Master Literature Organizers for additional storage. Constructed of polystyrene, each organizer measures 21.57 x 26.5 x 12.13 inches and has 24 compartments for holding documents. 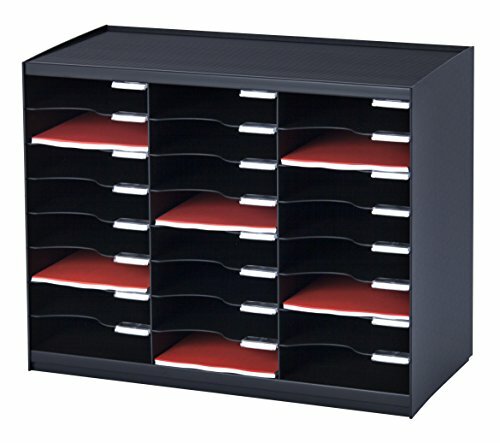 These organizers are great for student use in classrooms or in the office as an inbox/outbox system. Each unit provides ultimate organization in a space-saving design and is ready to use upon delivery. Labels and label holders provided. Contemporary solutions that perfectly fit your style and improve your performance - that"s PaperFlow. If you have any questions about this product by Paperflow, contact us by completing and submitting the form below. If you are looking for a specif part number, please include it with your message.